Cyfe, the ultimate all-in-one online business dashboard, makes it easy to track all of your finance Key Performance Indicators (KPIs) and analytics in one place. Getting started is free and easy! 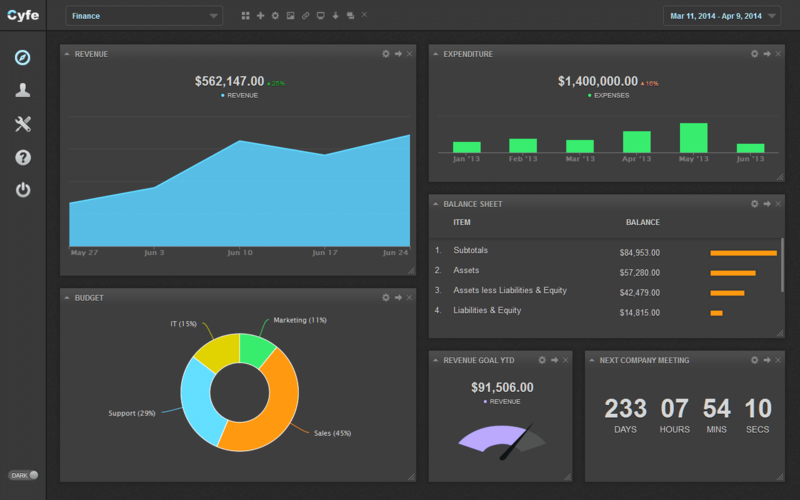 Use real-time data and metrics to monitor how your organization is by monitoring, in real time, your income statement, balance sheet, cash flow statement, key financial ratios, and more. Cyfe secure, easy-to-use connectors to your spreadsheets, your database, Quickbooks, Xero, and MYOB. As a finance professional, whether you’re a controller, CFO, real estate or private equity investment professional, Cyfe makes it easy to measure & report how your organization is doing. Even stay up to date with real time data on stocks and forex using a free finance dashboard from Cyfe. Quickly and easily share live dashboards, schedule automated email reports, or instantly-produce PDF or Excel reports to visually communicate the financial story behind the statements, making interpretation for your colleagues, investors and partners that much easier. With Cyfe, you always have the latest real-time data and metrics to track how your organization or clients are doing through secure APIs, and prebuilt connections with Xero, Quickbooks, MYOB, and much more, even the reports you have been storing on spreadsheets. Cyfe makes it quick & easy to automate your reporting and provide precise measurement on all aspects of your business, helping you monitor in real time how your organization is growing our free dashboards. This means you can easily show your colleagues, executives, teammates, advisors, or your clients how business performance is doing, while saving you precious time and making your job effortless. Not only does Cyfe securely centralize your proprietary metrics that you track through our Custom widgets, such as those in spreadsheets, your databases, or through our open API, but we also have Google Analytics, Salesforce, Mailchimp, social media, RSS feeds, and dozens of prebuilt integrations that give you easy-to-use, real-time dashboards for social media, clients, social media, SEO, marketing, sales, project management, IT, and much more, making Cyfe the best all-in-one online dashboard for all of your organization’s analytics.